--This place now boasts of having fourteen doctors. DRS. WINTON & WADDELL, PHYSICIANS and SURGEONS, North Manchester, Ind. Prompt attention given to professional calls day or night. Office in the building formerly occupied by Dr. H. Winton. DRS. E.W. & J.W. FORD, PHYSICIANS and SURGEONS, North Manchester, Ind. Special attention given to the treatment of all Chronic Diseases. OFFICE--Room formerly occupied by Drs. Ford & Hubbard. BODINE & ELSON, SURGEON DENTISTS. All work done at reasonable rates, and warranted. Examinations made free of charge. Office over Noftzger's hardware store, North Manchester, Ind. DR. J.H. WADDELL, PHYSICIAN AND SURGEON, LAKETON, IND. Prompt attention given to professional calls day or night. W.T. MENDENHALL, M.D. 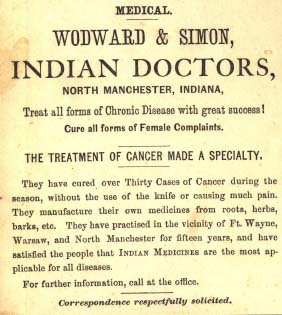 PHYSICIAN AND SURGEON, North Manchester, Ind. OFFICE upstairs, Heeter's block, north side Main street. Residence, two squares north of the American House. DR. C.B. RAGER, RESIDENT DENTIST, North Manchester, Ind. OFFICE in Heeter's block, north side Main Street. Satisfaction guaranteed. D. GINTHER, PHYSICIAN AND SURGEON, North Manchester, Ind. OFFICE over Noftzger's Hardware Store. Residence two squares north of the American house, on the west side of Walnut Street. J.H. WIRT, M.D., Eclectic Physician and Surgeon, Having permanently located in Manchester, offers his professional services to the people of this place and vicinity. OFFICE--On Main Street, upstairs over H. Mills grocery store, where he will be happy to attend to all calls in the line of his profession, at any time, day or night, when not professionally absent. Residence in Mrs. Miller's two-story brick building, near the School House, North Manchester, Ind. Dr. Phillip SHAFFER, PHYSICIAN AND SURGEON, Liberty Mills, Indiana. Prompt attention given to professional calls, would request patients with chronic diseases to call on Saturday, if convenient. Office north part of town, near the railroad depot, over McGees Furniture Store. Dr. Ginther has removed his office from Noftzger Hardware building, to the room occupied by Dr. Waddell over Lowry Brother's dry goods store, where he may be found, when not absent on professional duty. A.L. Stephenson has resumed the practice of Dentistry in all its branches. Office in the dental room formerly occupied by J.E. Bodine; over Noftzger & Co.'s Hardware Store. When I was asked to prepare a paper on the Medical History of North Manchester, I thought of the doctors of my childhood, my preceptors and later professional associates. Then I thought, the history of the healing art goes back to the very earliest inhabitants who were the Woodland People and the Indians. We know very little of the Woodland People, so we will move on to the Indian Medicine Man. His position was often hereditary. Occasionally he was one who didn’t want to be a brave or fight and so was permitted to take up other activities. These men were called “berdache” and wore women’s clothes. The medicine man traveled to the wigwam of the ill person and treated him with hot herb teas, poultices, and inhalations of steam. Hot water was used as an application to infected wounds and painful joints. Common ailments among the Indians were wounds and infections, arthritis, pneumonia, and near drowning, as few Indians could swim. The Medicine Man was very clever at reducing dislocations caused by wrestling. He also set bones. If all his efforts failed the Medicine Man stayed with his patient and told him about the Happy Hunting Ground where there was no pain or misery. The Medicine Men were held in great respect, regardless of the outcome of treatment. North Manchester is located in the area of the voyageurs, the great axis of French exploration and trade that extended from Quebec and Montreal to New Orleans. There is a French map of this area as early as 1632. The first French settlement was in Fort Wayne in 1679, with traders and trappers reaching this area. The military brought surgeons with them and so did the English whose military were here in 1765. Two surgeons to the regiment was usual. During campaigns more surgeons were added, these being frequently civilians “on contract”. Their armamentarium was limited and they treated mostly wounds and gunshot. They also treated civilians and sometimes Indians. The State of Indiana was founded in 1816. The southern half of the state was settled first, the north half being Indian lands, wilderness and a vast swampy area. To this area in 1836 came Peter Ogan, to found the Town of Manchester. There was already a settlement in Wabash, since 1834, and Wabash County’s first physician, Dr. Isaac Finley, in that year had a brick house on Lot 54 at the cost of three hundred dollars ($300). Dr. Finley was associated with Dr. James Hackelman. He gave fifty dollars ($50) to the construction of the first Court House and later contributed an additional fifty dollars (450) for that, this in 1839. Much later he was referred to as a respected pioneer. What was going on in the early 1830’s? Martin Van Buren was President, soon to be succeeded by the old Indian fighter, William Henry Harrison. A cholera epidemic swept over the country and six hundred people were said to have died in the Fort Wayne area. As recently as 1832 Indiana University in Bloomington was closed due to the epidemic and the nearby town of Hindustan was wiped out. A public spirited citizen, Dr. Daniel Drake, advertised in the Cincinnati papers what to do to prevent fatalities from cholera, but alas, there was no mail service and his good advice couldn’t be heeded. Mail too two weeks to reach the coast from Fort Wayne. Detroit was the area to which were related, merchandise came from there and also government and court officials. Chicago had been a frontier post as recently as 1812, Fort Dearborn, and only recently was becoming a business area. General John Tipton, also a United States Senator, was working on plans to remove the dependent Indians to the western lands, Kansas and Oklahoma. This was accomplished in 1838. The Indian Treaty at Paradise Springs near Wabash in 1826 opened this area for settlement. Fort Wayne had been under siege by hostile Indians in 1812 but following their defeat, the Land Office was opened in the Old Fort in 1816. The earliest land grant that I know of in this area is dated 1826. An event that was to make great changes in this area was the building of the Wabash and Erie Canal through Lagro, nine miles to the east. The Fort Wayne sector was begun in 1832 and reached Lafayette July 4, 1843. It was built by Irishmen with wheelbarrows, and one was said to have been killed for each mile of construction. Little regard was given to the health or welfare of the workers. The State of Indiana had been given 2277 640-acre sections along the Canal, which were sold for one dollar and twenty five cents (1.25) per acre. This cheap and fertile land attracted many substantial settlers and professional people. We do not know who was the earliest physician in North Manchester, but there is a record of the Upper Wabash Medical Society in 1841, listing as members Dr. William E. Willis of North Manchester, Dr. C.V.N. Lent of Liberty Mills, and Dr. Eichholtz of Laketon. Members were scattered through Marion, Logansport, etc. and since travel was on horseback, or rarely canal boat or stage coach, it soon broke up. I hope these remarks give you a little background for medical practice in the area. The pioneer was beset with all the rigors of the violent climate – sunstroke and fevers in the summer – frost bite and lung fever (pneumonia) in the winter. He battle against malaria – ague – and milksickness which came from cows eating poisonous weeds. The last buffalo in Indiana was killed in 1816 but there were deer, wolves, wild cats, panthers and venomous snakes for many years. Along with cholera was typhoid fever. A smallpox epidemic had decimated the Indians north of here as early as 1733. The pioneer worked with oxen and horses, with primitive tools; firearms were on hand at all times and there was much violence – fights, stabbings, shootings, murder and suicide. The early practitioner coped as well as he could, without too much training with bleeding, few medications except quinine, and calomel and a few herbal remedies. There was no anesthesia and whiskey was the universal remedy, and anesthetic if need be. There was no treatment for tuberculosis and many promising young people died of it. Appendicitis was fatal; hernias could not be repaired. Few people owned glasses; shoes were made without rights or lefts and even soap was made of lye and caused no end of small miseries. Hot water and home comforts as we know them were lacking. The pioneer worked hard, suffered much, and died young. The first hospital in Indiana was established at Vincennes in 1787 by Major Hamtramck of the British Army for his garrison there. This is the only hospital that we have record of until the State Lunatic Asylum was built in Indianapolis in 1845. Care was custodial. The hard life of the pioneer caused many minds to fail. In the northern part of the state, goiter was endemic and caused many wild insanities. This was later prevented by the use of iodized salt. The pioneer doctor was limited in his practice by transportation. He rode horseback and could only treat people within a short distance. Midwives took care of childbirth, often with poor results. For many years the mortality rate for childbirth was one in one hundred. Deaths occurred from miscarriages, hemorrhages, etc. all preventable today. Melanie in “Gone With The Wind” was one of these tragedies. Many children were left orphans and it was not unusual for the pioneer to have two or three wives due to this attrition. Infant and child mortality was dreadful, many families losing a half dozen children from childhood diseases. An 1854 practitioner in North Manchester was Dr. Daniel M. Marshall who had an office and residence at 126 East Main Street. He sold a TB cure and there are still bottles with his name on them found hereabout. He was the father of Thomas R. Marshall, the Vice President under Woodrow Wilson. Dr. Marshall moved to Illinois and later to Columbia City, Indiana. Early practitioners were trained by preceptors, and went a few terms to a medical college with few facilities. The need for better training became evident and Medical Societies pressed for continuing training and study. The Indiana State Medical Association was founded in 1849. Later members from North Manchester were M.O. Lower, C. Waddle, Horace Winton, and Phil Shaffer. The Wabash County Medical Society was founded in 1854, with no North Manchester members. Medicine changed little until the Civil War. Drugs and treatment were not greatly altered but some concepts of sanitation and the hospital came into being. The idea that every medical officer in the Civil War was a surgeon was wrong. Most treated medical disorders, typhoid fever, malaria and combat fatigue. Chloroform anesthesia came into general use at this time. Dr. C.V.N. Lent was the only physician in the North part of the county who served in the War Between the States. He is buried in the Lower Union Cemetery. Following the Civil War an Army Hospital in Indianapolis became Indiana’s first civilian hospital in 1866. Although there is a record of a hearse being used in Indianapolis in 1842, there is no record of an ambulance in use until after the Civil War, probably because there was no place to take the patient. People were born at home, suffered and died there. 1876 was the Centennial Year – the year of the Century as it was called. Here was a great stirring for better things, inventions to make life better and even easier. Steam engines, lawn mowers, washing machines, the telephone, bath tubs and more accent was put on sanitation and cleanliness. As early as 1881 the Naftzger house here had a bathroom. There was a revolution in labor – the McCormick reaper and binder had appeared about 1865; the steam engine revolutionized wood working and industrial operations. Two railroads came through North Manchester in 1871. Contact with the outside world was a great improvement. Numerous physicians came to our town, notably the Doctors Winton, Horace and Charles. They built their office at 115 East Main Street, now the VFW Building. 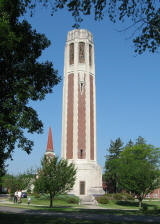 Both men, sons of Dr. William B. Winton, a Trustee of Wabash College, grew up in Crawfordsville, Indiana, and graduated from Wabash College before they attended medical school. Dr. Horace Winton graduated from Jefferson Medical College in 1865. It is uncertain if Dr. Charles Winton graduated from Jefferson, but both were talented physicians for their time. Dr. Horace Winton lived at 203 S. Maple Street and Dr. Charles built the brick house on the northwest corner of Market and Second Street. He later left here for a successful practice in Detroit. Both residences are still standing. A pupil of theirs was Dr. Eli C. Ohmart who was a graduate of the University of Michigan, no date. Dr. Henry Eichholtz the inventor, was a medical doctor who felt that practice was too strenuous, so he devoted himself to inventions and a wood working plant. Soon after 1876 he constructed a telephone which worked, but no one else had one so there was no one to talk to. He solved this problem with an extension and talked to his wife in their residence. Other practitioners in the 1880s and 1890s were Doctors Goshorn, John Lower, and M.O. Lower. The latter was an aggressive practitioner, built a fine home and office on the corner of Second and Market Streets, northeast corner. Dr. Lower removed cataracts, tonsils, and did mastoid operations in homes, and very successfully. He died in middle life of diabetes, for which there was then no treatment. Dr. Barnett had a home and office on Main and Sycamore Streets, southwest corner. Two of Dr. Lower’s pupils were Dr. Frank S. Kitson, a graduate of Rush Medical School and Dr. Leila Andrews from the University of Michigan. Both Dr. Lower and Dr. Andrews made calls on bicycles. Not long after the days of the Oklahoma Strip, Dr. Andrews moved to Oklahoma City where she became a prominent internist. Another talented practitioner was Dr. Loren S. Jordan. He specialized in eye operations, with much success. He later practiced in Wabash. Along with trained practitioners we had a self styled Indian Medicine Man, R.A. Schoolcraft. There were also powwow doctors and hexers. Medicine shows came in the summer and put on shows, minstrels and Wild West on Henney’s Lot on West Main Street. Dr. Tennant advertised a cancer cure for skin cancers. It was made of lye and coal tar. It was inflammable and a a batch ignited, nearly burning the house down. In the late nineties Mr. and Mrs. Sam Oldfather became Christian Science practitioners and set up a reading room and Church in their barn at the rear of 201 North Market Street. They attracted numerous people who were displeased with previous medical treatment, also alcoholics and hypochondriacs. They were reviled by the medical profession, but probably did more good than harm. Gradually practice was changing. Hospitals were established. St. Joseph in Fort Wayne in 1869 and City Hospital in 1878. Mental hospitals opened in Richmond in 1883 and in Logansport in 1888. More doctors studied at Medical Schools. There was a very creditable medical school in Fort Wayne which later merged with the State School in Indianapolis. Dr. W.W. Keene of Chicago, an eminent surgeon who was a Civil War veteran, was sometimes summoned for consultations, but it was usually too late and it is not known if he ever operated here. As is often the case, happenings far away influence the lives and fortunes of persons in small communities. Before 1881, there was no state effort to control epidemics, improve sanitation or keep records of vital statistics. All of this was done, or not done, on a county level. Records in many places were nonexistent. In Wabash County, much was destroyed by fire when the Court House burned in 1871. The first Indiana State Board of Health was organized by Dr. Thaddeus M. Stevens in 1881. His efforts were ridiculed and reviled and many times ignored but eventually the Board of Health became effective and vital statistics are available from 1882 on. State Health Officers labored to improve public health through quarantines, sanitation and education. The Medical Practice Act of 1897 registered physicians, kept records of their training and helped to unify and improve medical education in the state. Dr. J.N. Hurty was Indiana State Health Officer for twenty-five years and labored endlessly for the public good. Dr. Harvey W. Wiley of Purdue University is another important name, for his work in the Food and Drug Acts. As there was insistence on better education of physicians and surgeons, eventually all had gone to a medical school, first for three years, then for four. Later pre-medical studies became mandatory. Internships in accredited hospitals were recommended and by 1910 medical education was greatly improved. All prescriptions were written in Latin and the medical community was well educated. The early doctor was greatly assisted by the pharmacist who prepared potions, pills, and plasters by hand – also adhesive tape. Dr. David Ginther was probably the last to practice here without a formal extended education. [Ed. : Dr. Ginther did study at Ensworth Medical College in St. Joseph, MO, 1891] What he lacked in this was made up by experience and natural ability. He was probably the most loved and revered of any of North Manchester’s doctors. There were also some transient practitioners who came and went. Hospitals had been established in Wabash, Huntington, Warsaw, and Columbia City which served the community well. There never was a community hospital in North Manchester. Among the capable surgeons in this area were Doctors G.M. LaSalle, Wallace Grayston, E.B. McDonald, and Ben Linville. After 1900 great changes came about – rigid quarantine and controls checked epidemics. Food and Drug laws and improved infant care were a great advance. Diphtheria antitoxin, tetanus antitoxin, vaccine for typhoid fever, universal vaccination for smallpox all played their part. Care of tubercuous patients in State Sanatoria reduced tuberculosis. Insulin became available in 1922, saving many diabetics. Liver extract, B-12 was used to treat anemias. Blood transfusion and intravenous treatment became more sophisticated. The x-ray though in a primitive form, was a great advance in orthopedics, chest and abdominal disease. The change from chloroform to ether anesthesia made more extensive surgery possible and all surgery safer. There was much improvement in surgical technique also. Improved treatment of wounds and infections was an impact of the First World War. Due to all of these circumstances and better living conditions the life expectancy of 47 years in 1900 was increased to 57 years by 1929. The presence of Manchester College doubtless influenced numerous young people to obtain a medical education. This advertisement and others in this issue are from the 1875 Atlas of Wabash County. York where Indians were plenty and he acquired an early knowledge of their language, habits and medicines. From 1843 to '46 he was sent to school in New York, and in 1846, went to St. Louis where he joined a party of explorers, and in company with them crossed the continent, finally reaching Puget Sound on the Pacific coast. Here he took up his abode with the Blackfoot Indians and trapped for the Hudson Bay Fur Company, where he remained as one of the chief's family until 1852 when he returned home in company with some trappers by way of the Red River of the North, wintering in its valley. He reached St. Paul in November, 1853 and arrived in New York in December, after an absence of seven years. From 1854 to '55 he attended Medical College of Louisville, Kentucky, and in 1856 moved to Fond du Lac, Wisconsin, and commenced the practice of Indian medicine. He carried on a successful practice there for two years, when he buried his young wife, and in a distracted state of mind started for South America, visiting the principal cities of the coast, and spending a season in Cuba. He subsequently returned to New York in the spring of 1860 and started west to visit friends at Fort Wayne, Indiana, who prevailed upon him to remain and practice there. In 1861 he married again, and his practice becoming extensive, he took a student, who is now his partner. Dr A. Simon was born in Allen County, Indiana in 1839 and commenced the study of medicine under Dr. Woodward in 1861. In 1865 he and Dr. Woodward commenced practice together in Warsaw, Indiana and in 1866, Dr. Woodward, finding his health failing left him in charge of his practice, and with his wife and child crossed the plains to the Rocky Mountains, where he renewed many old acquaintances. In 1867, he was engaged in a trading expedition which left Denver City, Colorado for the Red River country. In Wyoming several hostile bands of Indians were encountered and in one affray Dr. Woodward was severely wounded but subsequently recovered so as to proceed with his party. Communication being cut off in their rear for two years their friends supposed the party to have been totally destroyed until their return to Denver City in 1869.
ing some time in mining in those regions with varied success until at last, when they had made rich and valuable discoveries and seemed on the point of realizing unbounded wealth, they were obliged, on account of a general uprising among the Indians to flee for their lives. Upon reaching the western terminus of the Southern Pacific Railroad, the Doctor sent his wife and child home by rail, but being short of funds, started across the country on horseback himself. In this dangerous trip the Doctor became separated from his companions and came very near being captured by Indians, being hotly pursued by them until his horse, exhausted by the length and severity of the long ride, without food and water, fell dead under him. In the long and tedious journey which was left him to perform on foot, The Doctor suffered hardships from which he has never fully recovered. He finally reached Fort Dodge in safety, however, from whence he was sent home to Fort Wayne on a free pass. He found Dr. Simon still practicing, and prevailed upon him to re-establish the old firm of Woodward and Simon at North Manchester in 1874.